The LG V30 builds upon the audio prowess of its predecessor, the LG V20, by featuring an ESS Sabre 32-bit Quad DAC complete with presets and digital filters to offer an audiophile grade experience even with not-so-capable audio hardware. Ahead of its official announcement during IFA 2017, LG has sent out a press release regarding the upcoming LG V30's audio capabilities. Already, renders showing off the V30's 6-inch OLED panel with a 2:1 aspect ratio and a 2880x1440 resolution has had fans excited for its release. 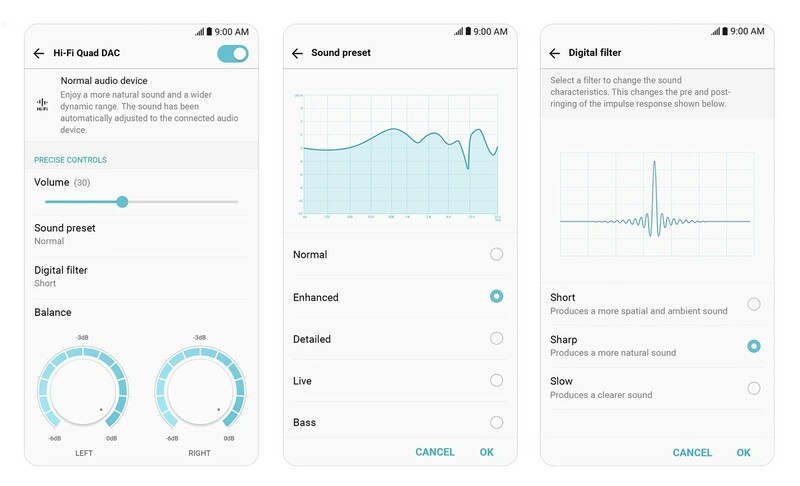 Adding more to that excitement is the fact that LG is now claiming that the V30 will feature "next-generation audio functions unseen in a smartphone before". The company says this is by virtue of a 32-bit advanced Hi-Fi Quad DAC powered by ESS's Sabre ES9218 audio chip. The LG V20 too boasted of some impressive audio performance thanks to the 32-bit Quad DAC and it looks like LG will taking things up a notch higher for the current iteration. As seen from the screenshots, the new DAC offers 4 sound presets — enhanced, detailed, live and bass. The hardware also allows the user to implement a digital filter to change the pre and post-ringing of the impulse response. LG claims that these settings will enable listeners to extract the best audio output possible even from conventional headsets. With wide audio paths and separate controls for left and right channels, the V30 surely promises to be a smartphone for the audiophiles. The company has teamed up with MQA for high definition audio streaming. The phone's audio receiver can also double up as a microphone (receiver-as-a-mic) for recording a wider dynamic range. The push towards audio utopia has led to another partnership as well, this time with B&O PLAY for overall fine-tuning of the listening experience. A set of B&O PLAY earphones will be bundled along with the handset as well. All in all, this looks to be a good proposition from LG to draw a lot of multimedia enthusiasts. With IFA 2017 just around the corner, its just a matter of time before we get to review the handset and put LG's claims to the test.